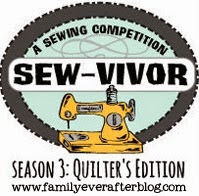 Well folks, it's that magical time of year when Amy over at Amy's Creative Side spreads the joy that is Blogger's Quilt Festival. If you've never heard of this before, please, for you own sake, crawl out from under your sewing machine and head over to look at the eye candy! Always a treat! So lets get to it shall we! 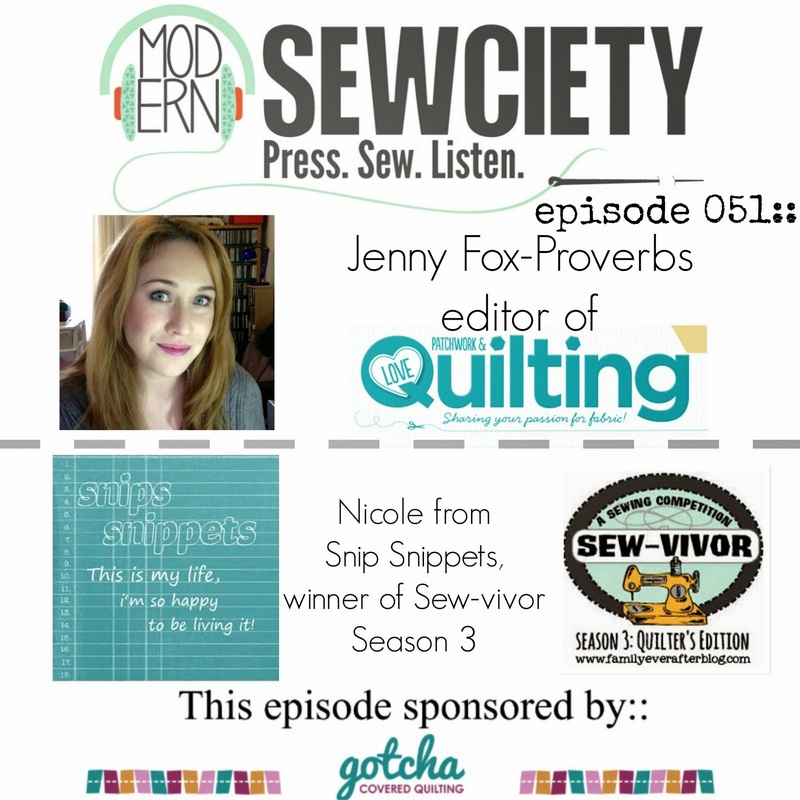 Good news is that the Blogger's Quilt Festival runs again in the fall, so can we all cross our fingers that i have it done in time for that one?! So i thought i'd throw my Fusion Stars quilt into the mix for this round. This is one of my most favorite quilts i've ever made. Made entirely with Kaffe Fassett's shot cottons, this one is incredibly soft and the drape is amazing! As soon as i saw Sarah's (Sew What, Sherlock) Fusion Star pattern, i knew i wanted to make an entire quilt out of it! What i didn't think about was the fact that i was going to need 153 sheets of paper (entirely paper pieced) to print out the pattern! So worth it though!! In order to keep the quilt as soft as i could i kept the quilting to minimum, and just echoed inside each star. I used a quilt as you go method for this one and i'm not entirely sure about the results. I guess i just don't like the idea of doing all that quilting and not being able to see it on the back. Next time, i may try the method where you QAYG with your blocks fully sandwiched and then join them with sashing? on the front and back. Not really sure how that method works, may need to do a bit of research first! 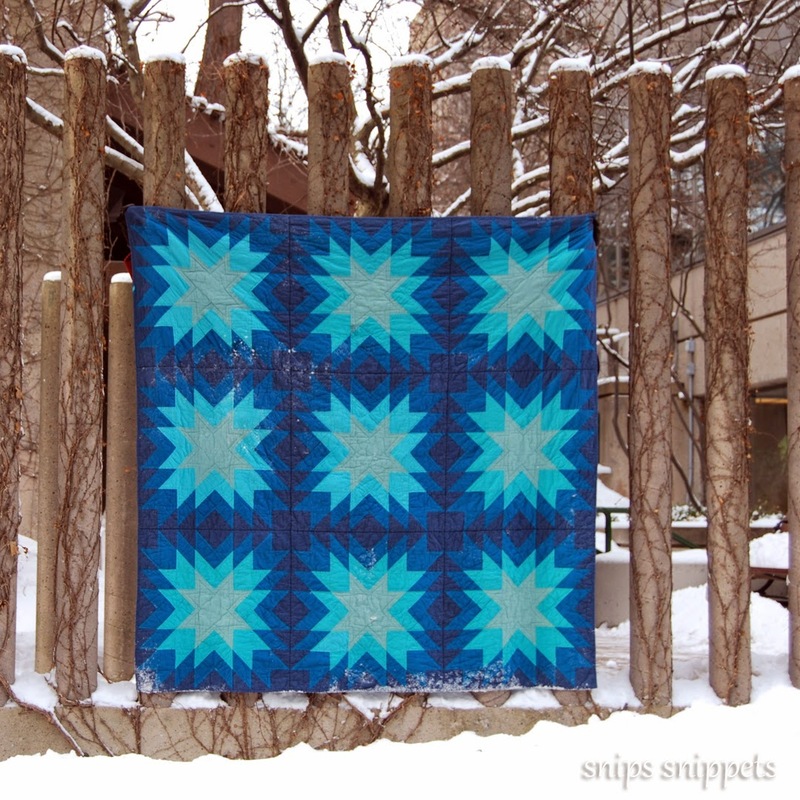 With a finished size of 69" square i'll be linking this one up in the large quilts category! 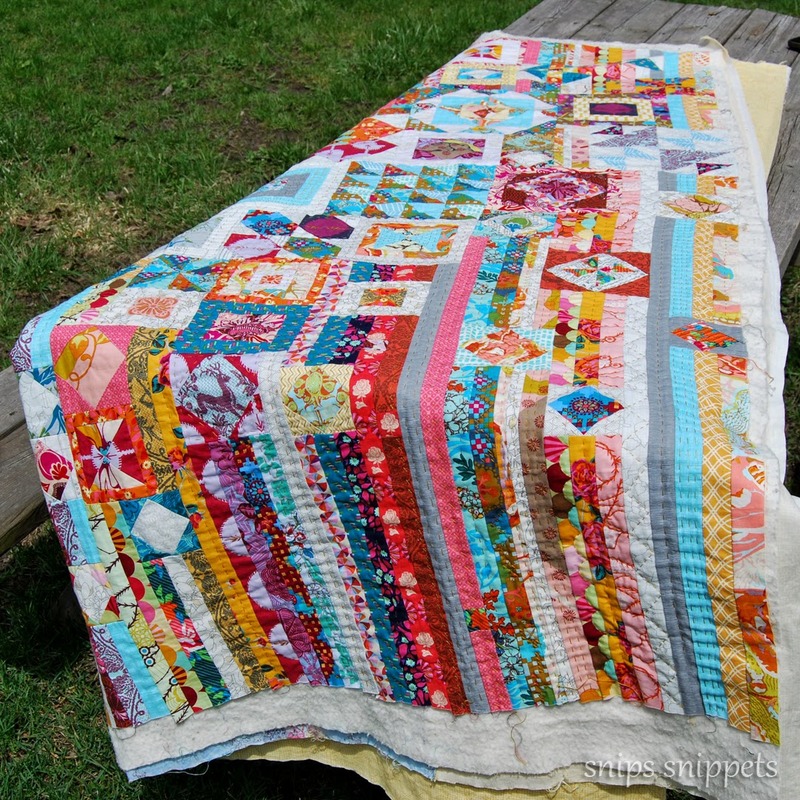 Pop on over and check out my competition, some exceedingly good quilts this year! For more pics and details here's my original post on my Fusion Star quilt. High fives for Amy's hard work, to give us this awesome opportunity to see some amazing quilts! Now calm down people, the gypsy wife quilt isn't finished! I had hoped to be finished by May 16th, in time for the Bloggers Quilt Festival over at Amy's Creative Side. But it seems that it's taking me longer than anticipated to hand quilt it! There's a good possibility that i may have gone a touch overboard with the quilting! For those that haven't seen any of my work on this, i'm using mostly Anna Maria Horner fabrics with a sprinkling of others from my stash. And i have to say, AMH fabrics were made for hand quilting! And with 12 wt Aurifil thread in brass, this has been so much fun! I honestly didn't think that i would enjoy the process as much as i am. I will freely admit that a great portion of my time is spent on how i'm going to quilt each block as well as each strip. 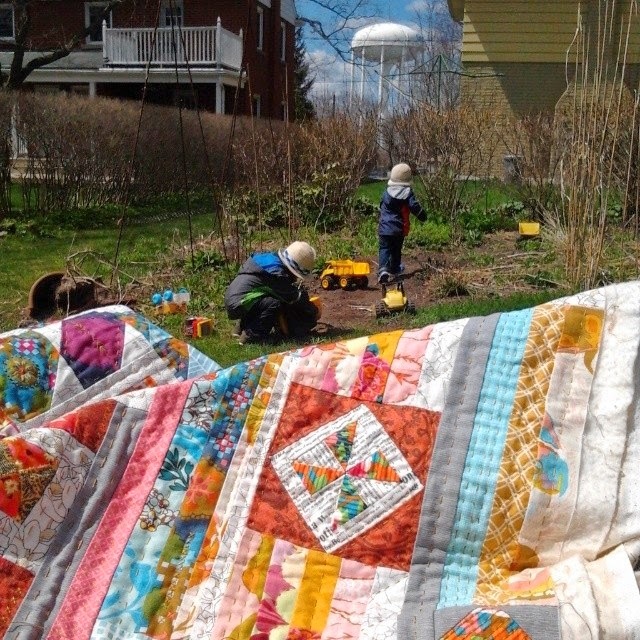 Some need just simple quilting, though others... well, they are just demanding to be more intricate! My hand quilting is still pretty amateur at best, but i'm starting to get into my own rhythm and style. And slowly my stitches will become more uniform. I'm about a quarter finished now, and i'm finding the strips take the longest to quilt. So the top half of the quilt which is mostly blocks should be a breeze! Right? I'll just keep telling myself that! I desperately want to show you the whole quilt, but i guess i should save it for the final reveal when it's all finished! Now, i have some tips and tricks that i want to share with everyone that's doing the gypsy wife but i'm not sure how i want to share. Right now most of what i have to share deals with the strips and the final construction of the quilt. I wish i had of made more notes during the construction of the blocks, though i do plan on making another so i could always add in more info. Do you think it would be easier if i just started a new page up top for just the gypsy wife stuff? That way i could add things as i feel. I'm kinda thinking that would be easiest. For all you gypsy wifers out there let me know, and feel free to ask any questions, i'll do my best to help! Linking up over at Freshly Pieced, it's been a while and i need to get back in the habit of doing a WIP Wednesday post!